A small, comfortable space, Jay House boasts both a quiet “sit-down” dinner feel, as well as a lounge area. Appetizers at Jay House range from Sushi and Toko Su, to Egg Rolls, Beef Teriyaki, Crab Rangoon and a Pu Pu Platter. Soups include the Teapot Seafood Soup, and Wonton Soup. Salad choices include the more unique like Seaweed Salad and Avocado Salad. Dinner dishes include Shrimp Tempura, Tonkatsu, Vegetable Teriyaki, Salmon Teriyaki, Sushi, Moo Shi, Sweet and Sour Chicken, Moo Goo Gai Pan, Chicken with Broccoli, Sesame Chicken, Sesame Beef, Orange Flavored Beef, Lake Tung Ting Shrimp, and Kung Pao Shrimp with Peanuts. Also offered are various noodles and rice dishes. 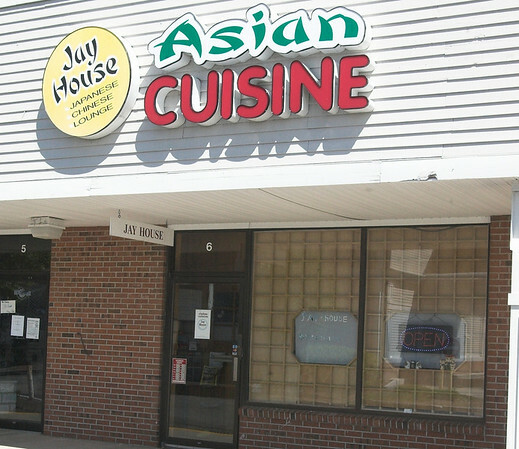 Jay House’s specialties include of Lemon Chicken, Crispy Shrimp, Peking Duck, Asparagus with Shrimp in Black Bean Sauce, and Lobster. Appetizers at Jay House range from three dollars to sixteen dollars for a Pu Pu Platter. Regular meals vary from five to twenty dollars. Jay House is open Monday through Thursday from 11:30 AM until 10 PM. On Fridays and Saturdays, they’re open from 11:30 AM until 11 PM. Sundays, the restaurant is open from 12 PM until 10 PM. Visit Jay House online, or at their location in the Crossroads Mall.